Do they serve 'upside down' cake? They should. I would love just being inside this shop! I'll put on weight just looking at this great place! Amazing reflections in that first picture JM! The ceiling mirrors are a nice touch! I love the reflections! I can see why it has lasted, looks like a charming place. Ceiling mirrors - waht fun. They really make the shop look opulent. Fabulous! Especially the first picture. I want to go there. May I know the name of the shop? One look at your captures for the day and I'm suddenly starving!! Love the mirrors in the ceiling! I can understand why it's lasted so long, too! Great reflections for the day, JM! Enjoy your weekend! @Hooked on Memes: The title is the name of the shop at downtown Lisbon. Holy Schmoly that first reflection is amazing. One of the best I've ever seen. Wish I could see that spot in person. Nicely done. That´s a beautiful (and yummy) place! Now, that's a great shot. Keep on clicking. great reflections. very elaborate decor for a pastry shop, so it must be decadent! 1829? 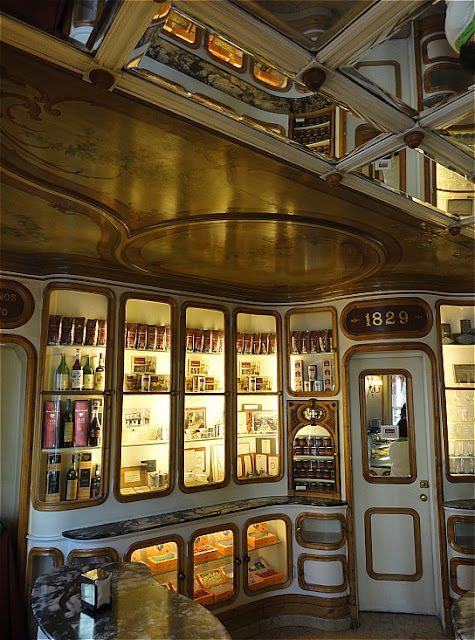 They have something to be proud: almost two centuries of delights in a great shop, perfectly photographed! Fabulous reflection and beautiful shop. How would one choose what to buy? Love the ceiling, it's amazing! With a mirrored ceiling! How very cool. This place would be my downfall, though. As I've told others, when it comes to pastries, I have lots of "will" power, but not enough "won't" power! Re your comment about the monkeys. I believe it! In 1957, while in the Navy, we spent a day in Gibraltar...some of the sailors climbed the mountain and said the monkeys there tried to steal their wallets, keys, etc. This is grand! Did you buy anything? Neat mirrors ! A perfect cjoice for the day ! I'd love to checkout this shop. Excellent reflections! I love that ceiling! Great reflection shots! Love this, what a fantastic reflection shot. Stunning. I just love the vintage decor of this shop but I would really go there for their custard tart and coffee that are made in the premisses. I always go there whenever I am in Lisbon for it reminds me of Paris. Nice focus! I think that is the most gorgeous store I have ever seen! The top photo is fabulous. I like reflections when it is unclear what is going on in the picture. JM, THese are wonderful. THey are so crisp and sharp. The light is beautiful. Bravo my friend. Dói o peito vir aqui e saber que não conheço essa Terra. I reckon I would like to reflect in that shop. what a beautiful shop , great reflection ! Tens estado a passear:) Lindo sitio! ...awesome photography....what a fabulous place...i would love to go there. A place I easily could have spent time and money! I could have some fun in there! You have some incredible photos here! Simply stunning!